The engine idle speed refers to the speed that the engine operates when it is in neutral or the clutch is disengaged and no throttle is applied. 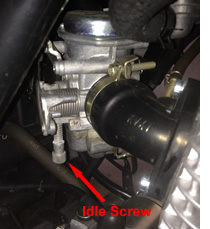 This is adjusted by a screw on the side of the carburettor indicated by the red arrow in the picture to the left. The idle speed should be set when the engine is at normal operating temperature so it is best performed after riding the motorcycle for about 15 minutes or so. The Honda manual suggests that the bike be placed on the centre stand whilst in neutral when adjusting the idle speed to the specified 1400rpm (plus or minus 100rpm). As the CB125E does not have a tachometer adjusting the idle speed accurately would require a hand held laser tachometer or something similar. I would suggest that when you first take delivery of your Honda and start to become familiar with it that you listen to the engine and how it sounds when it is idling. Should the idle speed require adjustment in the future you should be able to do it by ear without too much problem. I have only adjusted the idle speed on my CB125E once, at about the 500km mark when the engine was run in the idle speed increased slightly, probably because it had loosened up a little. The idle speed is unlikely to change suddenly, it may increase or decrease over a period of time as the carburetor wears or the mechanical state of the engine changes. If the idle speed changes noticably in a very short period of time it is more likely to be a symptom of some other problem, particularly if the engine is running roughly. Pursue the problem rather than adjusting the idle speed to work around it. 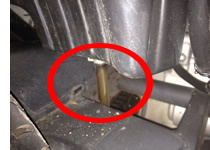 Look for things like vacuum leaks, blocked fuel strainers, negative valve clearance and fouled spark plugs. Inside most engines there are some pretty interesting forces at work, pistons go up potentially causing a vacuum in the area around the crankshaft, then they go down potentially creating pressure. The piston rings cannot seal 100% effectively so on the compression and ignition strokes particularly there are spent gases and unburnt fuel/air mixture escaping into the crank case (this is called blow by) once again affecting the pressure inside the crankcase. There are other factors as well but these two are especially worth a mention. If the crankcase was completely sealed it would rapidly pressurize with some really interesting results. This is easily controlled by putting a hole in the crankcase well above the oil level where the engine can dispel any excess pressure and breathe effectively, allowing the crankcase to remain at normal atmospheric pressure. In the good old days this breather was simply a hole in the crankcase that had a plastic tube connected to it that usually looped between the engine and the swingarm and dumped anything that came out of it either onto the ground or into the air. Effective but not very environmentally friendly. In these much more eco-friendly times the liquids dispelled from the crankcase are collected and the escaping gases are directed through the carburettor and into the engine where they can be burnt. To this end the crankcase breather on the Honda CB125E is directed into the airbox, any excess liquids (mostly oil) are collected in a tube underneath the airbox (pictured). The tube must be emptied periodically. Remove the tube, a pair of pliers may be required to compress the spring clip, drain the contents and reinstall the tube. Dispose of the contents in a responsible fashion. Regardless of whether your Honda CB125E is a daily ride like mine or only comes out on sunny weekends it should be periodically inspected to ensure that it is in good condition and safe to ride. This inspection should be performed every 4000kms (2500 miles) or three months, whichever comes first. The idea is to inspect the whole motorcycle so your inspection should not be limited to the things I mention here, particularly if you have modified or changed anything on the machine. If you added a top box check to make sure it is not about to fall off. The car behind you will appreciate not having a top box come through their windshield. Start at the front and work your way to the back, I dont want to seem dramatic but your life depends on it.